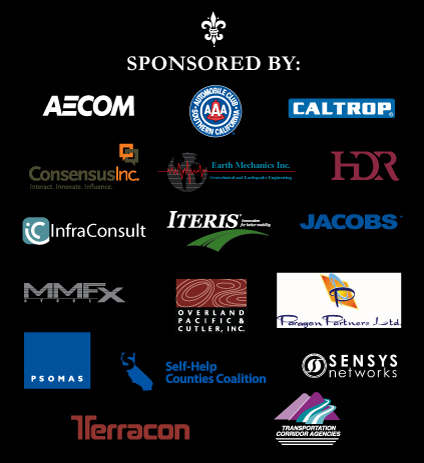 Sponsorships for the 11th annual Southern California Transportation Summit are now open to the general public! This year’s theme, “We’re All in This Together,” promises a diverse group of transportation stakeholders, engaging breakout sessions and high-profile keynote speakers. 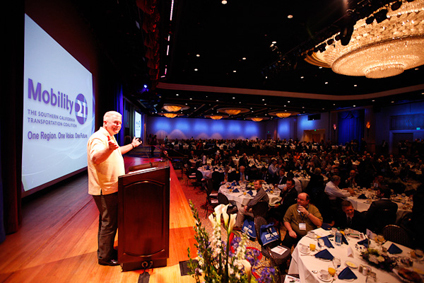 The Summit will take place on Friday, Sept. 28 at the Disneyland Hotel in Anaheim. These companies have already signed up to sponsor this year’s Mobility 21 Summit. Don’t let your business be left out! Click here to view the sponsorship packages. E-mail Marnie O’Brien Primmer for more details or call 949.288.6884. 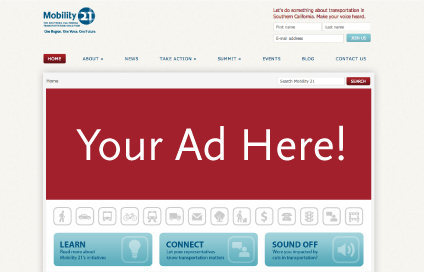 Looking for ways to maximize your transportation marketing dollar? Mobility 21 is now offering online ad space at competitive prices. Feature your company on our website homepage, in our monthly e-newsletter or in Southern California’s first transportation advocacy mobile phone app now under development. Contact Kristin Slocum for more information and pricing. From Oct. 14-17, join more than 800 transportation practitioners from around the nation who believe strongly in the role of land use and transit to enhance livability at the annual Rail~Volution conference in Los Angeles. This year, Mobility 21 will be hosting the Welcome Reception on Sunday, Oct. 14 at Los Angeles Union Station. Thank you to Stacy and Witbeck for their Welcome Reception Presenting Sponsorship! Click here to view additional Rail~Volution Local Host sponsorship packages. Special offer: Sponsor the Mobility 21 Summit and get 10 percent off a Rail~Volution local sponsorship! Contact Marnie O’Brien Primmer atmprimmer@mobility21.com or 949.288.6884 for more details. Want to learn more about Rail~Volution? Click here to visit the conference website. This month, we turn our attention to new California Transportation Commission (CTC) Chair Joseph Tavaglione for an in-depth look at how the the Commission will handle economic challenges and California’s growing transportation needs. M21: What are some of your goals as Chairman of the California Transportation Commission (CTC) this year? 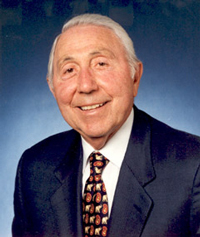 Joseph Tavaglione: As the new Chair of the CTC, I will continue to work closely with the legislature and the administration to protect existing funding and to identify funding alternatives to address California’s transportation needs. I will also work to enhance and strengthen the state’s successful partnership with our regional transportation agencies and other stakeholders to focus on efficient and effective project delivery. For nearly 10 years, the CTC has identified that limited transportation funding has been, and will continue to be, the key issue facing transportation in California. We continue to rely on static funding levels even though our ability to fund critical improvements has been eroded by increased vehicle fuel efficiency and fixed rates. Reliable, sustainable and growing transportation revenue sources are critical to California’s economic vitality and global competitive advantage. The Commission’s collaborative partnership with Caltrans and our regional transportation partners in the delivery of projects is critical to the delivery of transportation improvements. The CTC recognizes that our regional partners are investing heavily in our transportation system, and are working closely with Caltrans to address critical state, regional and local needs. Stronger partnerships will allow us all to leverage available resources to address the most critical needs. M21: What is the statewide needs assessment and what role will the CTC play in addressing it? JT: The CTC launched the development of a statewide transportation needs assessment in order to better understand how we can best preserve, maintain and improve the state’s transportation system over the next decade. The goal of the assessment was to identify the multi-modal needs of our transportation system and to identify possible strategies and funding solutions to respond to such needs. The needs assessment reflects a projection of anticipated federal, state and local revenues estimated at $240 billion (13 percent federal, 22 percent state and 65 percent local). The investment needs for California’s transportation system of pedestrian and bike facilities, transit, passenger/commuter rail, highways, local streets and roads, and access to ports and airports is estimated at $538 billion. The investment needs are composed of the cost of system preservation (rehabilitation and maintenance) — estimated at $341 billion, and system management and expansion — estimated at $197 billion. The shortfall between projected revenues and investment needs is estimated at $296 billion. In order to address the funding shortfall, the Commission’s attention will now be directed at identifying process and regulatory improvements and possible funding scenarios to present to the Governor of California, the California Legislature and the California Congressional Delegation. The Commission will be pulling together our transportation stakeholders to thoroughly vet policy recommendations. M21: With the economic challenges throughout the state and nation, what lies ahead for the CTC in the coming months? JT: Notwithstanding the state’s economic challenges over the last few years, the Commission has been pretty busy with programming and funding transportation projects. However, this is a pivotal year for the delivery of some of the larger Proposition 1B programs. The Commission is on target for the delivery of the Corridor Mobility Improvement Account (CMIA) and State Route 99 programs. All remaining projects in these two programs are planned to be under construction by Dec. 31, 2012. The Commission expects to make close to $2 billion in allocations through June 2012 for Proposition 1B programs. These allocations should provide for badly needed economic stimulus and the creation of thousands of jobs. The current economic downturn has provided one tangible benefit for transportation projects, that is, lower construction costs. Across the board, we have been able to utilize contract award savings to fund additional projects that would otherwise be shelved. In the Corridor Mobility Improvement Account of the Proposition 1B, as an example, the Commission expects to recycle almost $900 million in CMIA savings through the end of June 2012 and potentially another $300 million through the program’s December 2012 deadline. These savings (almost 25 percent of the original program) have and will result in additional performance improvements and at the same time create more jobs. We have accomplished wonderful things, but we have a huge need ahead of us. The end of the Proposition 1B programs should leave all of us wondering as to what lays ahead. The development of the statewide needs assessment is one tool we can use to build consensus around the state’s priorities. However, we do need to collectively keep focused on identifying strategies and funding solutions that allow us to plan for a better future. M21: How do the state’s fiscal challenges impact Southern California? JT: As I look back over the last few years as a member of the CTC, I am proud to say that we have accomplished amazing things with the collaborative efforts of Caltrans and our regional transportation partners. However, we need to continue to work together to address the many issues facing transportation in 2012 and beyond. We need to establish stable, sustainable and growing transportation funding alternatives that will enable California to meet its mobility, economic and environmental objectives, and provide Californians with the transportation network they expect and deserve. Southern California, as other regions around the state, is in the midst of developing a forward-looking regional transportation plan. As this plan identifies regional transportation needs it will also be required to prioritize those needs within fiscal constraints. Southern California has a proven record of successfully working together and with state and federal agencies to identify innovative project delivery and financing options. The CTC will continue to work with all regions to look for innovative approaches to facilitate the successful implementation of those regional and state priorities. 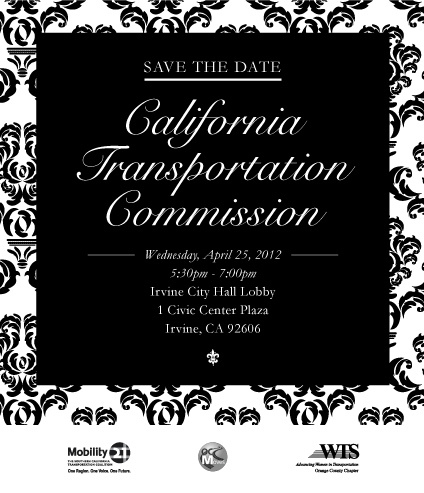 Join Mobility 21, WTS-OC, the Orange County Business Council’s OC Moves and the Orange County Transportation Authority at the April California Transportation Commission (CTC) reception. It’s not too late to sponsor this event, which promises to be filled with the movers and shakers of the transportation industry. For $500, your company will be featured on pre-event marketing, event signage and during a brief presentation at the reception. Contact Marnie O’Brien Primmer if you are interested. Yesterday, Governor Jerry Brown reappointed Mobility 21 Board Member and Orange County Business Council President & CEO Lucy Dunn to the California Transportation Commission. During her time as a commissioner, Dunn has been an important voice representing the transportation needs of Southern California. Join us in congratulating her on this well-deserved reappointment! Earlier this month Mobility 21 issued an action alert asking you to send a letter to your member in the U.S. House of Representatives to pass a transportation bill before the current bill expires March 31. Earlier this week, the House and the Senate agreed and passed a 90-day extension of the federal surface transportation program. The extension bill is “clean,” meaning it does not include any policy or funding changes from current law. It extends the highway and transit programs through June 30, 2012. This is the ninth extension of the program since the current transportation bill expired on Sept. 30, 2009. The President is expected to sign the extension legislation in time to avoid a March 31 shutdown of the program. 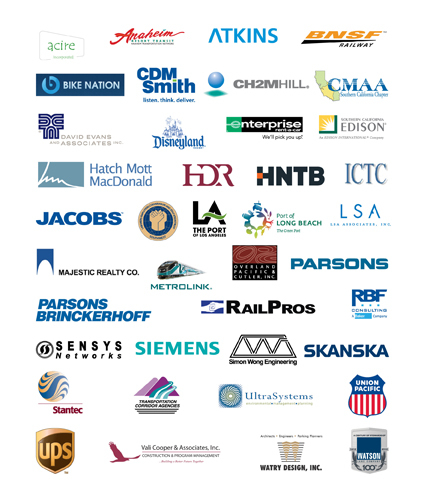 This letter-writing campaign, together with those spearheaded by groups like the American Road & Transportation Builders Association, the U.S. Chamber of Commerce and the Southern California Contractors Association, is critical to our continued fight to bring transportation investment to Southern California. 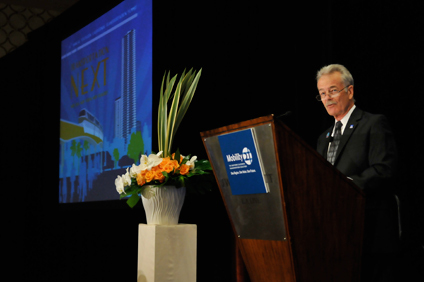 2011 Mobility 21 Chair Will Kempton, CEO of the Orange County Transportation Authority, welcomes the audience to the 10th Annual Southern California Transportation Summit. Each year, the California Transportation Foundation (CTF) awards outstanding transportation projects, people, programs and organizations. This year, Mobility 21 will receive the “Organization of the Year” award. CTF will present Mobility 21 with the “Organization of the Year” award for our coalition’s work in 2011 at the 23rd Annual Transportation Awards Luncheon on May 23 in Sacramento. Click here to register. 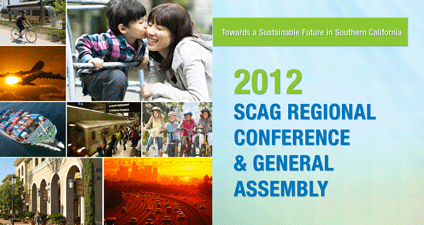 On March 21, the Southern California Association of Governments’ (SCAG) Policy Committees convened a joint meeting on the Draft 2012-2035 Regional Transportation Plan (RTP) / Sustainable Communities Strategy (SCS). The Policy Committees overwhelming recommended to the Regional Council the adoption of the Proposed Final 2012 – 2035 RTP/SCS. The plan presents housing and transportation options that encourage creation and revitalization of communities that are bike and pedestrian friendly, affordable and sustainable. This will result in people spending less time in their cars and thereby reducing traffic congestion and pollution and benefiting from a healthier environment. With the action, the Regional Council will consider adoption on April 4 at this year’s General Assembly at the Bonaventure Hotel in Downtown Los Angeles. To view the complete plan, summary of benefits, economic analysis fact sheet and other information, visit SCAG’s website. The Board of Directors of the San Bernardino Associated Governments (SANBAG) recently named Dr. Raymond W. Wolfe as the new Executive Director of the agency. 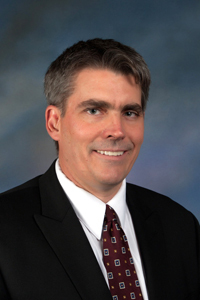 Dr. Wolfe has been the District 8 Director of Caltrans, which encompasses Riverside and San Bernardino counties. He will succeed Interim Executive Director Ty Schuiling, who has been serving in that capacity since Deborah Barmack retired as SANBAG Executive Director in August 2011. Once Dr. Wolfe assumes his new position on April 9, he will join the Mobility 21 Board of Directors. Archaeologists work to uncover a water-wheel grist mill built in the 1820s. 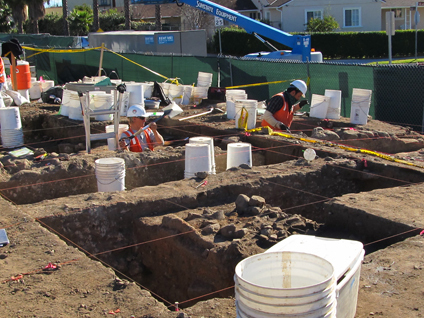 Archaeologists have found thousands of historic artifacts while excavating in the railroad right-of-way near the San Gabriel Mission, founded in 1771. The excavation is part of the ongoing preparatory work prior to the construction of the Alameda Corridor-East Construction Authority’s (ACE) San Gabriel Trench grade separation project, set to begin later this year. The newly found cultural resources uncovered during the archaeological excavation adjacent to Main Street between Mission Road and Ramona Street in the City of San Gabriel include remnants of a ”mill race” or water-course channel that powered a water-wheel grist mill built in the 1820s, the foundation of an adobe building dating from the early 1800s, an 1816 silver coin depicting King Ferdinand VII of Spain minted in Lima, Peru, Native American shell and European glass beads and thousands of other artifacts from California’s Mission period and later. “The archaeological finds are an exciting link to the region’s past and shed insight on the important history of the San Gabriel Mission, the City of San Gabriel and the Gabrieleno Tongva Tribe,” said ACE Board Chairman and San Gabriel Mayor David Gutierrez. The 2.2-mile San Gabriel Trench grade separation project will result in the lowering of a 1.4-mile section of Union Pacific railroad track in a trench through the City of San Gabriel with bridges constructed at Ramona Street, Mission Road, Del Mar Avenue and San Gabriel Boulevard, allowing vehicles and pedestrians to pass over the tracks. Once completed, the grade separation project will eliminate congestion, emissions from idling vehicles, train warning horn and bell noise, delays for emergency responders and the potential for crossing collisions. “The New Frontier” represents the many changes on the horizon in the Transportation Demand Management (TDM) industry. 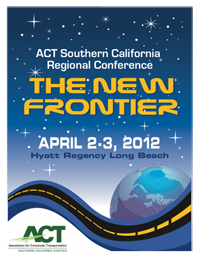 This year’s Association for Commuter Transportation (ACT) Southern California Regional Conference will bring together TDM’s brightest stars to help navigate the latest technologies and theories. The 2012 Alternative Clean Transportation (ACT) Expo is North America’s largest convergence of stakeholders committed to air quality improvement by reducing emissions from mobile sources, representing an array of clean vehicle technologies for various applications. This event will showcase all alternative fuel types including electric, hybrid, hydrogen, natural gas, propane and renewable fuels. Over the course of three days, the ACT Expo agenda will feature keynote speakers, plenary and breakout sessions, networking events, technical tours and a ride-and-drive event to walk attendees through the economic, energy and environmental benefits of alternative fuel use. 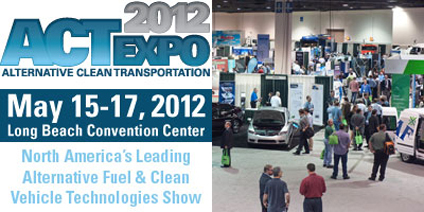 The discussions that take place at ACT Expo 2012 will result in sustainable alternative fuel projects and enduring clean transportation initiatives in the months and years ahead.